America's high tech workers are tending toward more healthy lifestyle, and many say they are out to elevate their philosophies and bodies as a result of the disciplined education, and technology skills they have learned. The findings are taken from more than six months of ongoing discussion and internet surfing to websites where we have found advanced information on diet, body-mind, simplified decor and fashion and a more elevated mental health regime. According to Researcher Swan Dive of Zen Dope Magazine, there is an entire Zen philosophy base emerging within the workforce and catching on with older teens as well. According to Raven Walker "Western Zen" is one of the new voices of the American West, author and psychologist, Raven Walker, writes on the most important subjects of the new milenium: "We teach it to read, write, do numbers, and know facts, but otherwise leave mental life to wander as it pleases. What is missing is a practical theory for conditioning the mind. Zen's intuitive psychology fills this void." Zen Dope Magazine opens three categories of the rising modern zen life, "The Zen of it", "The Dope" and "Rethink" covering every aspect of daily Zen practical application. "The Zen of Dancing", "Coffee Zen" and "A Bug in the Cosmic Soup" are but a few delightful article and video titles bringing American Zen fully into public view. Zen Dope Magazine is on the high tech curve of intellectual humor and art fusion, which is what Modern Zen is all about. If you would like more information about this topic, or to schedule and interview with Swan Dive, email Zen Dope; attn: Swan Dive at Zen_Dope@aol.com. NEW ZEN: A CULTURE MERGE WITH HIGH TECHY LIFESTYLES THAT GIVES WAY TO INCREASINGLY POPULAR "MODERN ZEN"
The "Trend is Zen!" Zen Cubes, Zen Cars, Zen Gardens, Zen Stones and a catch-all "Zen for Everything" new buzz phrase "Just Zen It!" Modern high tech workers and rushed families are leaning hard toward more healthy lifestyles, surfing websites regularly to find advanced information on diet, body-mind connections, simplified decor and fashion as well as active deliberate mental health regimes. According to Zen Dope Magazine Researcher Swan Dive, "There is an entire Zen Movement emerging within the workforce and catching on with all age groups." American West, author and psychologist, Raven Walker, writes on the most important subjects of the new millennium: "We teach it to read, write, do numbers, and know facts, but otherwise leave mental life to wander as it pleases. What is missing is a practical theory for conditioning the mind. Zen's intuitive psychology fills this void." Further, researchers see new Zen Styled merchandising cropping up in the usual hotspots on the internet. 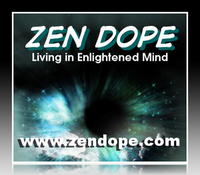 Zen Dope Magazine is hot on the trail of this eclectic emerging movement called Zen Life with categories: "The Zen of it", "The Dope" and "Rethink" covering every aspect of daily Zen practical lifestyle. "The Zen of Dancing", "Coffee Zen" and "A Bug in the Cosmic Soup" are but a few delightful articles and video titles bringing American Zen fully into public view. Zen Dope Magazine is on the high tech curve of intellectual humor and art fusion lifestyles, which is what Modern Zen is all about. all copy press release contact files are kept at: Zen_Dope@aol.com in PRESS RELEASES folders.